Taxco® franchise…now YOU can provide accounting, tax and business solutions with the backing of registered professional accountants. We take the burden out of tax preparation – your clients just drop off their tax information at Taxco and we assist you to do the rest. The hassle free tax filing option!!! Polokwane, Alberton, Germiston, Springs, Benoni, Boksburg, Brakpan, Roodepoort, Krugersdorp, Rustenburg, Rosebank, Vereeniging, Van der Bijl, Soweto, Johannesburg, Braamfontein, Sandton, Tswane, Potchefstroom, Welkom, Kroonstad, Harrismith, Sasolburg, Pinetown, Pietermaritzburg, Ladysmith, Newcastle, Dundee, South Coast, Ballito, Durban, Durban North,Umhlanga, East Londen, Port Elizabeth, George, Mosselbay, Knysna, Boland, Cape Town, Bloubergstrand, melkbos, Bellville, Wynberg, Paarl, Kimberley, Thaba N’chu, Qwa-Qwa, Upington, Nelspruit. The overriding rationale is that new franchisees must not affect the profitability of existing franchisees whilst they themselves must be commercially viable. Our vision is to open more than 100 Taxco® outlets with double the number of smaller TaxBox associates, supporting the Taxco franchisee in the next few years. Who are ideal Taxco® franchise operators? We are keen to talk to established accounting or tax firms who seek to be part of a larger group who wish to grow their business and have easy access to a vast wealth of knowledge while being part of a well established, recognised and respected brand. A special tailor-made solution will be designed for each franchised member firm, with the added benefits of joint sales, marketing, training, proven operational methods and procedures and branding at a reduced franchise fee. Experienced persons in accounting or tax or accounting graduate candidates wishing to start their own business with a recognised brand and who would not otherwise have had access to the resources and expertise of an established accounting and tax firm, with the added benefit of being their own boss. Any person who identified a definite need for accounting, tax and business services in his area and who has the entrepreneurial skills to obtain and manage the necessary skilled personnel to run a professional services business. The success of franchising is based on the premise that most people will find it a lot easier to build a new business under the guidance of an established organisation, using proven methods and procedures, rather than by trial and error. Initial and ongoing training, the use of a well-known trademark, access to joint advertising and purchasing and a host of support services, typically offered by the franchisor, are just some of the advantages franchisees enjoy. The success of every franchise operation rests upon exact duplication of the franchisor's “blue print”, in other words, every franchisee will be expected to operate a carbon copy of the franchisor's original business. Individuals who thrive on "doing things their own way" are unlikely to be happy as franchisees. Bill Cherkasky, a past president of the International Franchise Association (IFA), said that " perhaps franchising is not perfect, but it is the best method known to mankind to put people with no prior experience into a business of their own and help them to succeed." As with most things in life, careful preparation and meticulous execution is the key to success. Within a relatively short period, modern-day franchising, more fully described as "business format franchising", has evolved to become the most popular business concept ever created. Essentially, franchising is a marketing and distribution system. It has its roots in the United States, where it has been in evidence since the early 1950's and now commands a market share approaching 50% of all retail sales. Although other parts of the world lag somewhat behind, franchising is well established in every free market economy across the globe, and with good reason. Statistics show that the chances to succeed of any small business operated under a franchise are infinitely higher than those of a business that is operated by an entrepreneur in isolation. South Africa has a vibrant franchise sector and one just needs to consult the yearbook of the Franchise Association of Southern Africa (www.fasa.co.za) to see that a large number of divergent business concepts, many of which have become household names in their own right, are operated under a franchise. The secret to this success is that the franchise operator uses a proven concept namely It’s brand, proven products and services, quality control and marketing procedures. Statistics show that the failure rate of franchises set up by established businesses is about 5%. There are more than 30 000 franchise outlets in operation in South Africa. Taken at a conservative 15 direct and indirect jobs per franchise, that equals more than 450 000 jobs. No wonder a 30%-35% annualized industry growth rate, coupled with a low failure rate, stands out in a country facing 35%-40% unemployment. As a result, the Department of Trade & Industry (DTI) has concluded that part of the solution to SA's unemployment crisis can be found in franchising. With SA now being one of the fastest-growing franchise economies in the world, franchising offers exciting opportunities for entrepreneurs. Government therefore intends developing a comprehensive strategy of support for the sector, including financial and non-financial support services and a new regulatory environment for franchising. If you want to find out if franchising is really for you, we suggest you visit South Africa’s number one website for free franchise information and advice at www.whichfranchise.co.za. You can research the ins and outs of franchising and also take a “Franchise Self-Test”. Strong sales skills. This means the ability to get potential customers to see the benefit of your products and service offerings and to conclude the deal. Good interpersonal skills. You will be selling a professional service offering to owners of a business or senior decision makers within an organisation as much as dealing with the commission and salary earning employee. Your clients are from all walks of life and with varying levels of income demanding different levels of maintenance. You need to be PC literate and understand basic computing. Our training will give you the necessary expertise and skills in all the different tax, accounting and business offerings etc. Good team leadership skills whilst paying attention to detail. This entails being able to lead your teams, set deliverables for them and ensure that they are met, by organising, prioritising and executing ations timeously. Share our passion for running a professional service business. 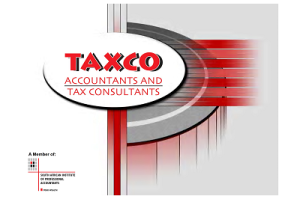 TAXCO® is a registered trademark an is utilised under license by Taxco® Franchise Group Trust IT110/2011 for the establishment of a network of special tax accounting firms throughout Southern Africa. Taxco was the name of the original business entity, a partnership founded in 1991, on which the franchise group is modelled. You, the franchisee can opt to use the standard Taxco® branding and logo or use the Taxco ® brand name in conjunction with other words to better describe your business in your area, or any other unique attributes of your business i.e. Taxco® Accountants, Taxco® Tax Specialists or Consultants, Taxco® Tswaranang or Taxco® Business Services to name but a few. Use of the Taxco® branding is not compulsory. The Taxco® branding can thus be adapted to suit the fast, efficient, no hassle SOHO (small -office -home -office) tax service type enterprises, or the more professional, corporate type offices. All Taxco® franchisees and TaxBox associates make reference to being a Taxco® Member Firm. Existing accounting firms can therefore keep their existing branding with only reference to being a Taxco® member firm. This practise however is not encouraged and these members may have increased branding costs. Over the years Taxco’s service offering has increased tremendously and now these services are offered to clients nationwide within the framework of a franchise model. Taxco offers clients a range of services to meet their accounting, tax and other business requirements. The packaging of our services offering ensures the full spectrum of client accounting, tax and other business requirements are met, and irrespective of the size of a client, Taxco has a solution. The services offered in this website make up our service offering. See the complete services offering under the Services tab. Taxco® understands the requirements and pressure on compliance and good governance of our clients, and is here to address the needs for compliance as well as increasing the productivity of our clients. Taxco do this by offering solid, affordable business services by providing an outsourced service that make good business sense. Each franchise is an individual business, managed by its business owners, with their own specialist disciplines, client bases, territories and work ethic, being responsible for maintaining a superior standard of service delivery compared to the industry standard. All the franchisees are trained, accredited and certified by Taxco Head office, which is an SAIPA accredited training centre. This ensures the franchisee is able to provide consulting, operational, and infrastructure services in the accounting, tax and various other business fields. Franchisee training is overseen by a FASSET registered moderator ans assesors. For more information about the corporate profile of Taxco®, the trustees, member firms, services, mission and goals refer to the"About Us" section page of this website. Why own a Taxco® franchise? Standing at the forefront of tax accounting, the Taxco® franchisee provides vendor-independent, best-of-breed customized tax, accounting and business solutions and is modelled on a highly successful accounting and tax firm, which has been in operation for over 20 years. Taxco® offers a turnkey solution to it’s franchisees, where they provide outsourced services to their clients through an established process. Peace of mind is offered when starting your own business as the Taxco® franchisee is further backed up by Professional Accountants (SA) who are knowledgeable about our industry and international best practices to help you take full business advantage of the best, and most suitable tax, accounting and business solutions on offer today. Smaller accounting and tax firms are now able to network with similar firms, whilst keeping autonomy and reaping the benefits of being part of a larger group. South Africa has a huge emerging taxpayer market and our service offerings are specially targeted at providing an inexpensive, efficient and professional business and tax service to the growing number of small business owners and tax paying employees. Taxco Head office (Bloemfontein) provides centralised sales, service delivery and fulfilment, technical and operational support and business coaching to the franchise network, assisting the franchisee to work on growing their businesses rather than concentrating on the ordinary routine tasks inside of it. A countrywide network in South Africa with experienced and certified professionals and consultants and a full service offering in all accounting, tax and other business solutions sets Taxco® apart from it's competitors and enables franchisees to access a wide a variety of clients, fields and markets. The franchise model further allows our experienced tax professionals, who are committed to assisting franchisees, to offer their expertise and personal service on a much broader scale via franchisees at a location convenient to taxpayers. Franchisees on their part can now access Taxco’s vast amount of experience and have access to accounting and tax research materials, templates and guides gathered from many sources over the past 20 years. Taxco® professionals strive to offer the very best service and are constantly updating their tax knowledge to ensure that every tax return prepared by the franchisee are correct and to the best legal tax consequence for the taxpayer. No matter how simple or complex a tax return - even if it involves negative gearing, capital gains or business income - we help you to take advantage of the current tax laws for your client to legally minimize the tax payable and to maximize refunds at competitive rates. Taxco® further has solid partnerships and correspondent firms expanding it's services and has a strong working relationship with Softline Pastel, Vanilla Payroll, Emminent Wealth Insurance Brokers, FNB Instant Accounting, Investec Private Bank, Nedbank Corporate Saver, Ooba Bond Originators, ESET, MAC Designs, Sable Document Imaging, CIPC and SARS for the franchisees to draw on. We continually research new business opportunities and add these to our accounting, tax and financial service offering which translates directly into increased revenue for the franchisee, which may not have been possible for the smaller firm. The value of owning the Taxco® brand in a certain area will most definitely increase as the brand and services offering grows throughout South Africa and becomes the household brand for the accounting and tax service company of choice. Generally a Taxco® Franchise will be one or more franchisees, who have a formal qualification in accounting or tax and are practising members of the ICB, SAIPA, ACCA or SAICA and wish to make use of the benefits of being part of a recognised and respected accounting and tax services brand. It is a requirement that the Taxco franchise will operate from a professional office, in-line and within the professional standards, rules and regulations as stipulated by the applicable institute or professional body, the Department of Labour and approved by Taxco Head office. The professional Taxco® franchise would generally require more personnel an equipment than the smaller TaxBox associate office. Taxco® does not have an one-size-fits-all approach and every franchise will be assisted and tailored to suit the area it is operating in. Taxco head-office will provide guidance to Taxco® franchisees with the help of a qualified moderator and assessors to assist them to run their practices within the required guidelines set down by their governing body, prior to any monitoring visits of the institute. The Taxco franchisee on the other hand will further assist and deliver services to smaller TaxBox associates on a mutually beneficial basis in his area, if any, as well as the full spectrum of Taxco services to it’s clients within the Taxco network, where it has the authority of the applicable governing professional body and legislation to do so. A Taxco Franchise may at any time convert to a TaxBox Franchise, should it qualify to do so, and vice versa. The Taxco® Franchise revenue model is geared towards the building up of a recurring revenue stream ensuring the continued sustainability of the franchisee. This revenue model is established and has been refined over several years of business. Financial statements are often only an annual revenue opportunity. A client will request the compilation of financial statements, usually due to legislative prescriptions or as a requirement of finance applications. Franchisees not qualified to draw up the financial statements in terms of IFRS or any other required reporting standard will be assisted by an appointed Taxco franchisee or Head office on a joint venture basis as the circumstances may dictate. Responsibility will be shared for the collating and processing of information, the compilation of the statements and the consulting and distribution thereof thereafter. Contract, Forms and Letter templates are supplied to the franchisee at start-up and sold to clients directly at a suggested retail price or applied for own use. The templates cover a wide range of topics and situations and have many different applications. Taxco® continually update these templates to accommodate changes in legislation or circumstance and is provided on a as-and-when basis to franchisees. The cost thereof is included in the management fee. Franchisees are empowered to market our associates and business partners value-added products and services i.e. Softline Pastel software, Training, Vanilla payroll, Ooba bond originating, Eset anti-virus or insurance products of Emminent for their own account. Franchisees will deal directly as value added re-selers of the various products and services. Only the margins, not the sale value, will be taken into account for the calculation of monthly turnover. Head office’s written permission is required should the franchisee wish to market, deliver or sell a product or service not otherwise provided by the Taxco Group. Franchisees are encouraged to source good value products for distribution by the group. Training as a revenue stream is showing significant growth and franchisees charge for these services on a basis of time spent or value added as agreed with the client. Irrespective of whether an organisation out-sources or retains accounting and tax activity in-house, training is required for the client processing staff, users of the information and management as our industry is forever evolving and tax laws and processes change regularly. Income from training will depend on the expertise of the Franchisee, which in turn is gained by experience or formal training. Revenue models have been based on a typical franchise as described above. Variations of the franchise model are expected dependent on the needs of the franchise owner or investor. The revenue projections can be adjusted if variations of the typical franchise model are required. The recurring revenue component of overall revenue will steadily become a higher percentage of the overall revenue generated. The franchise business is structured as an owner (manager) run business model. This allows for low-cost operation and therefore low risk. This maximizes the profit opportunity for the franchise and the return on investment. The recurring revenue model provides sustainability of the franchise. Once a client is installed and operational on the core product, and the service is delivered in accordance with the expectations of the clients, the recurring revenue model should continue. The recurring revenue model also provides the flexibility to the owner of the Franchisee to decide on their own growth model – this model is dependent on the desired lifestyle of the franchise owner. The projections below factor in very conservative client acquisition levels. Prospective Franchisees should note that the prospects and figures quoted herein are projections based on previous experience and in no way guarantee future performance levels. No specific or exact revenue models are provided as the services delivered and expenses incurred are uniquely of a personal nature and vary with the skills, training, experience and size of the practice of the franchisee. Taxco™ provides a backup service to franchisees and do not guarantee or warrant any income or any new business. Each franchisee must define and calculate his own expected revenue or income dependent on the needs and work ethic of the franchisee or investor. It is our estimate that the monthly Turnover for the ideal Taxco® Franchise with (2-4) personnel would be in the region of R100,000. The estimated Net Income based thereon shoud be between R30 000 to R50 000 per month as fixed base costs of the premises and personnel may vary. It is up to the franchisee to determine if the monthly revenue is realistic and achievable by the franchisee in his area and as monthly and annual clients grow, how this income will grow exponentially. The recurring revenue component of overall revenue will steadily become a higher percentage of the overall revenue generated as time goes on. The core product of the Taxco franchise is the take-on and on-going tax and bookkeeping services to SME, corporate and large organizations. The core product provides the key recurring revenue model to ensure sustainability and growth of the franchisee. The revenue projections combine core product service delivery and the other revenue streams of the franchisee. Proof of being a practicing member of one of the following professional governing bodies is required: ICB, SAIPA, ACCA or SAICA. The Franchisee is required to strictly adhere to the rules of such governing body and assistance will be given to the Franchisee by pre-monitoring advice and guidance. Incentives are available for purchasing an additional Taxco™ franchise outlet -preference is further given to current franchise members. Monthly fees payable to franchisor: 8% management fee (covers service updates, administration and same business day telephonic and online support) and a 2% website usage and update and national marketing fee (does not include local or regional advertising - for franchisee own account) and is based on the franchise turnover exclusive of Vat. This marketing fund is kept in a separate fund and the franchisor has full discretion as to the strategy and operational activities thus conducted. The franchisee is encouraged to provide ideas as to the optimal use of the marketing fund. An annual fixed fee with limited telephonic and online support and "Pay per use" option, is also available for the more established franchisees. Included in the franchise package is an information package and illustrations for the franchisee to assist him with the sign writing and branding of his office. The franchisee decides from where he wishes to operate and grow his business and this may include: A shop-style office or kiosk in a business complex, a suite in an office block, an office at home or other premises as he may choose. It is in the discretion of the franchisee to equip and brand his office. Our recommendation is that the franchisee secures a accessible place where the clients can comfortably visit and consult and the Taxco® brand name is visibly displayed, although this is not a pre-requisite. Securing a suitable premises would normally entail the signing of a lease agreement with a landlord and although we may give advice in this regard, it is the sole responsibility of the franchisee to ensure that he is aware of all the legal and financial implications thereof. The franchisee will be responsible for his own working capital which may vary from area to area and includes, marketing, rent, salaries, telephone and printing expenses. We suggest that a franchisee compiles a budget, calculates a break-even point and provides sufficient financing for at least six months in this regard to ensure that personal and business costs are covered. Additional training will be charged at R1550 per person per day, a customised training package is available for franchisees to train additional staff members in specific areas of expertise. (Above excludes meals, travelling and accommodation). On the approved sale or transfer of his right, title and interest in his franchise of a franchise outlet in a designated area, such a notification of cession shall be accompanied with a payment by the franchisee of R20,000 (twenty thousand rand) VAT excl. to the franchisor, before the effective date of the purported sale, which amount shall be utilised by the franchisor to properly train and establish the new owner of the franchise. The franchisor has a first right of refusal to purchase this franchise. We do not provide direct financing or furnish any security to franchisees. Taxco® will assist with applications for finance in the form of the provision of core information about the TaxBox/Taxco® franchise for inclusion in his application, it is up to the franchisee to make his own informed judgements and decisions on the different purchasing and financing options. They have innovative and tailor-made solutions to make your franchise dream a reality which include Biznetwork, a networking platform, FNB Instant accounting, online and cell phone banking, asset and vehicle finance. It’s role is to maximise finance for SME’s in a way that leads to the development of sustainable small and medium businesses, job creation, economic growth and equity. Previously disadvantaged communities and a bias towards woman empowerment is the preferment. An agency of the South African Department of Trade and Industry who’s mission is to develop, support and promote small enterprises throughout the country, ensuring their growth and sustainability in co-ordination and partnership with various role players. To this end it offers SMMEs advice, counselling, mentorship, guidance and access to vital contacts through its nationwide network of 9 provincial offices other district branches, mobile units, Enterprise Information Centres and Technology Incubators across the country. Before you decide to finance your business refer to our Business Guide on Financing. Please contact us should you require any additional information in this regard. Taxco® places a strong emphasis on having qualified consultants and all franchisees will receive local and internet-based training to become fully proficient in making their business a success. Once set up, they will receive ongoing service and technical support necessary to secure new business and to increase margins and success. Initial training is provided to the franchisee at our head office in Bloemfontein for 4 days. The scope of the training covers all the services that TaxBox/Taxco® offers, use of the practice manuals, the tax and accounting software and includes pricing and practice management. The franchisee’s laptop computer is setup at the same time. Additional training to partners and employees of franchisees on specific topics can also be provided on a pre-arranged basis, normally at R1250 per day, excluding travelling, accommodation and/or meals. (Max 2 persons per session). Normally a franchisee would train his own staff based on the start-up training he received. Training and certification by Taxco Head office in Bloemfontein. Business mentoring via the internet for the initial 6-months by a business consultant to review performance, growth opportunities, identify and solve areas of improvement and to assist with the general running of the franchise. Customised hardware and software to enable the franchise to commence with the tax, accounting and business services. Business day telephonic and email support for all circumstances and situations. Getting started with your Taxco® franchise. Submit signed Franchise Agreement with Capital charge payment. The purpose of this disclosure document is to assist the potential franchisee to decide whether this unique tax business opportunity is for him/her. Whilst it describes aspects of franchising, you are strongly advised to also rely on the advice contained in the many books on the subject written by experts in the field and available from FASA (The Franchising Association of Southern Africa). You are further encouraged to conduct the necessary research in making your decision, seek assistance from other accountants and other financial expertise and then discuss the franchise agreement with your attorney to make an informed decision. Note: You should have received and scrutinized this disclosure prospectus at least fourteen days before signing the franchise- or any other binding agreement. Should you consider there to be an opportunity for you to become a part of the TaxBox/Taxco™ franchise network complete the online application form or contact Mr Pierre Goosen at our National Head office in Bloemfontein. His telephone number is (051) 447 0825/7, or pierre@taxcotrust.co.za for email contact.